^ Duke, Lynne (1997年5月20日). “Congo Begins Process of Rebuilding Nation”. Washington Post. p. A10. http://www.washingtonpost.com/wp-srv/inatl/longterm/congo/stories/052097.htm. "Guerrillas of Angola's former rebel movement UNITA, long supported by Mobutu in an unsuccessful war against Angola's government, also fought for Mobutu against Kabila's forces." ^ a b Duke, Lynne (1997年4月15日). “Passive Protest Stops Zaire's Capital Cold”. Washington Post. p. A14. http://www.washingtonpost.com/wp-srv/inatl/africa/april/15/zprotest.htm. "Kabila's forces -- which are indeed backed by Rwanda, Angola, Uganda and Burundi, diplomats say -- are slowly advancing toward the capital from the eastern half of the country, where they have captured all the regions that produce Zaire's diamonds, gold, copper and cobalt." ^ a b c Thom, William G. (1999). Congo-Zaire's 1996-97 Civil War in the Context of Evolving Patterns of Military Conflict in Africa in the Era of Independence. XIX. Journal of Conflict Studies. http://www.lib.unb.ca/Texts/JCS/bin/get5.cgi?directory=fall99/&filename=THOM.htm. ^ CDI: The Center for Defense Information, The Defense Monitor, "The World At War: January 1, 1998". ^ Vlassenroot, Koen. “Citizenship, Identity Formation & Conflict in South Kivu: The Case of the Banyamulenge.” Review of African Political Economy. 2002. 499-515. ^ Autesserre, Severine. “The Trouble With Congo: How Local Disputes Fuel Regional Conflict.” Foreign Affairs. 2008. 87(3). 94-110. ^ Pomfret, John. "Rwandans Led Revolt in Congo; Defense Minister Says Arms, Troops Supplied for Anti-Mobutu Drive." Washington Post. 09 July 1997: A1. Reyntjens, Filip. The Great African War: Congo and Regional Geopolitics, 1996-2006. Cambridge: Cambridge UP, 2009. Gribbin, Robert E. In the Aftermath of Genocide: the U.S. Role in Rwanda. New York: IUniverse, 2005. Clark, John F. (2002) The African Stakes in the Congo War. New York: Palgrave Macmillan. ISBN 1-4039-6723-7. Gondola, Ch. Didier. (2002) The History of Congo, Greenwood Press, ISBN 0-313-31696-1. Covers events up to January 2002. Prunier, Gérard. Africa's World War: Congo, the Rwandan Genocide, and the Making of a Continental Catastrophe. Oxford: Oxford UP, 2009. Vlassenroot, Koen. “Citizenship, Identity Formation & Conflict in South Kivu: The Case of the Banyamulenge.” Review of African Political Economy. 2002. 499-515. Vlassenroot, Koen. 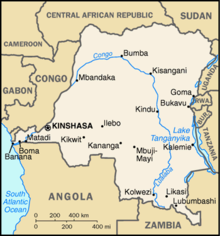 "Conflict & Malitia Formation in Eastern Congo." Ed. Preben Kaarsholm. Violence, Political Culture & Development in Africa. Athens: Ohio UP, 2006. 49-65. Lemarchand, René. The Dynamics of Violence in Central Africa. Philadelphia: University of Pennsylvania, 2009. Jackson, Stephen. ‘Making a Killing: Criminality & Coping in the Kivu War Economy.’ Review of African Political Economy. 2002. Reyntjens, Filip. "The Privatisation and Criminalisation of Public Space in the Geopolitics of the Great Lakes Region." Journal of Modern African Studies 43.4 (2005): 587-607. Autesserre, Severine. “The Trouble With Congo: How Local Disputes Fuel Regional Conflict.” Foreign Affairs. 2008. 87(3). 94-110. Thom, William G. (1999). Congo-Zaire's 1996-97 Civil War in the Context of Evolving Patterns of Military Conflict in Africa in the Era of Independence. XIX. Journal of Conflict Studies. http://www.lib.unb.ca/Texts/JCS/bin/get5.cgi?directory=fall99/&filename=THOM.htm.